The Red Accordion Diaries: Flats and Hills. Today was a much better day. We saw one gorgeous flat and one hideous flat. But even the hideous flat had a gorgeous view, so that improved our moods a lot. Also, the gorgeous flat was in a delightful neighborhood with a really nice landlord. Things are grand, as always, but we are really looking forward to getting settled. I can't wait to get my own Wifi, so I can get back to blogging regularly, as well as teaching piano lessons to you patient folks. Thanks for waiting ... I promise lots of pictures and not to teach you too many deedly-dee tunes. Tonight, David has a very important mandatory Post-Grad Pub Crawl to attend. In the MBA, it's all about networking, you know. You keep your eggs where??? Free Olde Stuff, Beaches, and Bus Rides. Dancing? I should stick with piano. 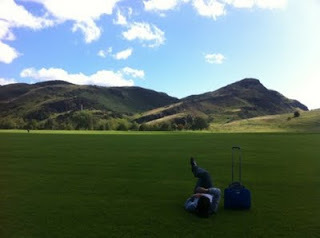 My Little Cabin Home ... in Edinburgh? Mobiles, the 1980s, and ships in the night. A brief rant followed by a piece of good news. Househunters International starring ... us! Homes, friends, and black currant jam. Pretty Packing vs. Efficient Packing.